On September 29, CWPPRA Outreach visited with local Girl Scouts at their big event; the B.I.G. (Believe In G.I.R.L.) Event, hosted by Girl Scouts Louisiana East. Hundreds of scout groups walked the grounds of the University of New Orleans, bouncing from activity to activity. The aim of the event was to introduce girls to STEM, life skills, the outdoors, and other potential interests. Participants could learn about trade schools, non-Newtonian fluids (oobleck), and even get on a Coast Guard helicopter. Our table was constantly bustling despite being at the corner of the event. Our activity books, #ProtectOurCoast posters, and stickers were flying off the table. Our Wetland Jeopardy game was also a big hit, with teams playing cooperatively or with head-on competition between scouts. Nearby, the UNO Environmental Science department had a table set up to demonstrate how wetlands attenuate storm surge and form our first line of defense, the Master Naturalists of New Orleans brought some fascinating insects and a diamondback terrapin, and the Great Coastalini from CPRA (Chuck Perrodin) revealed the Louisiana coastline’s disappearing act. On Tuesday, May 2, 2017, the Coastal Wetlands Planning, Protection, and Restoration Act’s Public Outreach staff participated in the annual Coastal Day at the Louisiana Legislature. This event, organized by the Coast Builders Coalition, aims to educate legislators about the tremendous effort being made to protect and restore Louisiana’s coast. Coastal Day is a key moment to communicate with and educate representatives and legislators from across the state about the value of protection and restoration of Louisiana’s coast. The CWPPRA outreach team shared a number of publications at Coastal Day containing information regarding what CWPPRA is, the effectiveness of its projects, and the future of coastal Louisiana. In addition to distributing information and answering questions regarding CWPPRA’s completed, active, and future projects, the outreach staff attended a meeting in which Governor John Bel Edwards spoke highly of restoration efforts in Louisiana and the importance of the 2017 Coastal Master Plan. He also recognized the value of wetlands to both the state and the country, declaring his enthusiasm to move forward with the opportunity to resolve the coastal crisis and become more adept at water management. In addition to the governor, speakers including Representative Jerome Zeringue, Senator Dan Morrish, Johnny Bradberry with CPRA, and Scott Kirkpatrick with Coast Builders Coalition discussed issues affecting Louisiana’s coast. 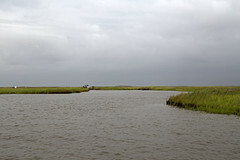 Steve Cochran with Restore the Mississippi River Delta and the Environmental Defense Fund discussed a recent poll in which a resounding 97 percent of voters agreed that Louisiana’s coastal wetlands are important to them. It’s never too early to start thinking about sustainability- that was the message embodied by participants at the Louisiana Green Schools Youth Summit on March 24 held at the Audubon Zoo. An event organized by the Louisiana Environmental Education Commission and the Louisiana USGBC Chapter, the summit brought together students in grades 5 through 12 to discuss green initiatives in their schools and learn about other aspects of sustainability. Staff from the Coastal Wetlands Planning, Protection, and Restoration Act were there with information about the many different types of careers, including engineering, geology, and tourism, that contribute to coastal restoration efforts. CWPPRA staff also had #ProtectOurCoast posters and issues of WaterMarks for students. With almost 90 participants and exhibitors including Louisiana DEQ, Joule Energy, and The Green Project, the Youth Summit was an opportunity to look at how groups focusing on different aspects of sustainability, including CWPPRA’s wetland restoration projects, come together to create a better long-term future for Louisiana. The Louisiana Environmental Education Commission (LEEC) provides environmental education news from across Louisiana, including information on environmental education programs, workshops, and grant opportunities. The state symposium furnished opportunities for formal and non-formal environmental educators from Louisiana and surrounding states to meet and share teaching techniques as well as multiple concurrent sessions for various topics and grade levels. Keynote speaker Dr. Jessica Kastler, Coordinator of Program Development at the Gulf Coast Research Laboratory’s Marine Education Center, used individual cases of endangered species to engage the audience in explorations of the process of science while cultivating environmental stewardship. In addition to the keynote speech, presenters in 15 concurrent sessions provided lesson demonstrations, hands-on workshops, and/or exemplary programs. The Coastal Wetlands Planning, Protection, and Restoration Act Public Outreach Staff was among exhibitors with a multitude of materials to assist teachers of all grade levels in furthering their students’ knowledge in environmental education and coastal protection.